With Tetris there are no aliens to shoot or banks to rob, just a charmingly simple and utterly addictive computer game. The drama was all behind the scenes. Fortunes were made and lawsuits fought as Tetris swept the world in the 1980s and killed a million conversations. But 20 years after the creation of this technological phenomenon, its inventor Alexey Pajitnov is only just beginning to make any money. Back in 1985, in the Cold War Soviet Union, the man responsible for one of the most addictive computer games in history was a jobbing scientist at the Russian Academy of Science. Where his predecessors had monitored Sputniks and calculated Soviet superpower, Pajitnov was able to indulge his love of puzzles and human psychology. It took him less than a fortnight to write the code for what would become Tetris, although he was delayed by his growing passion for his own invention - what he called "testing the system". Work stopped, beards grew and ashtrays filled as Pajitnov's colleagues joined in the Zen-like game of creating solid lines out of rapidly descending T-shaped on-screen blocks. Word spread, floppy disks of the game followed and, before long, Moscow had gone Tetris-crazy. The game spread throughout the eastern bloc and only stopped at the Iron Curtain. 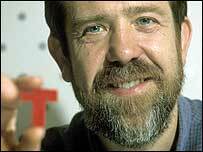 Events conspired to make Tetris the success it proved. Mikhail Gorbachev's rise to power in the Kremlin lowered trade barriers between east and west, and created a new capitalist awareness among Russians. Game developers in the west like Atari and Nintendo were creating new portable consoles - perfect platforms for the simple design that was Tetris. At the same time, entrepreneurs like Robert Maxwell had noted the huge market potential of electronic entertainment. All were beating a path to the door of Tetris, which meant getting the signature of one man - Evgeni Belikov at Elorg, the Russian ministry for the export of software. Pajitnov may have invented the game, but in the Soviet era there was no notion of individual copyright - the state owned all ideas. After much dispute over the various rights to the game, Belikov finally signed the most lucrative licenses to Texan dynamo Henk Rogers, who had been entrusted with securing the rights by Nintendo, which wanted to launch Tetris as part of its new Gameboy package. Before long, it was statistically likely that anybody with a computer game in their hands was probably playing Tetris. It proved a cross-generational, cross-gender success; its appeal variously explained by the feeling you could always do better, and the pleasure in making sense out of chaos. Many people complained of Tetris-fuelled dreams, and the shapes were even projected on to office buildings. Meanwhile, a spurned Robert Maxwell planned to pursue the matter with his Kremlin contacts while an indignant Atari set to work on a lawsuit. Both failed, leaving Gameboy to take the world by storm, lining the pockets of everyone from Rogers to Russia. Everyone, that is, except the inventor of Tetris. The same Soviet restrictions that had delayed Pajitnov game going global ensured its inventor remained just another salaried employee of the Science Academy. Tetris belonged to Russia, not any individual, and Pajitnov never even received a bonus from his employees. But the fall of the Iron Curtain presented opportunities to Pajitnov. In 1991 he took up Rogers' invitation to settle in the United States, where he established his own company for game development. Only when the Tetris licences were renewed in 1996 did he finally begin to receive any royalties. By this time, Pajitnov had followed the yellow brick road all the way to - guess where - Microsoft. He was the giant's first staff games designer, and Bill Gates is surely drumming his fingers, waiting for Pajitnov's inspiration to strike again. As Tetris reaches a whole new generation through mobile phones, with even bigger fortunes to be made, Pajitnov remains philosophical about his place as a cog in the great capitalist machinery. "You could always make a little more," he says, "but I never seriously think about this stuff. I live as I live." Tetris: From Russia with Love was broadcast in the UK on BBC Four on Thursday, 12 February, at 1900 GMT and repeated on Sunday, 15 February, at 2205 GMT.